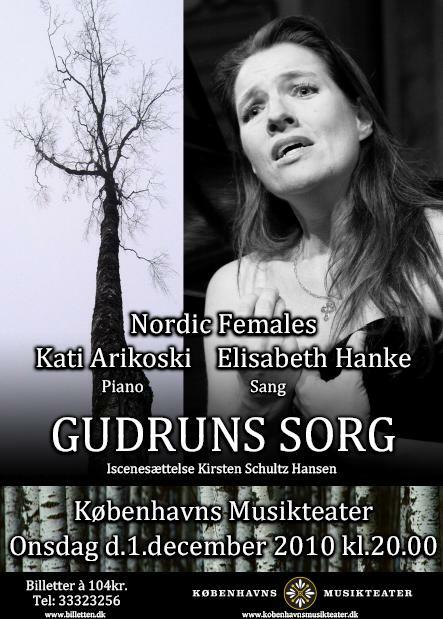 Kati Arikoski & Elisabeth Hanke will perform works by Peter Heise (DK) & Markus Fagerudd (FIN). 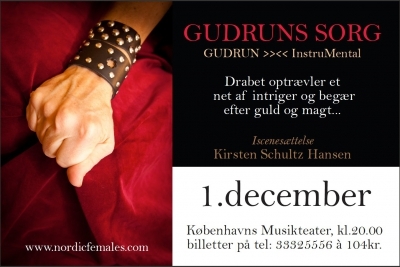 Gudruns Sorg & Heise combined with InstruMental I & Fagerudd as a staged version! Great concert in the concept of Nordic Females, performed by Nordic Females! A piano player is for a short while engrossed in an unknown score, puts the book aside og begins practicing on the piano. While he plays a woman has entered the room insisting upon rendering the songs in the book. The pianist listens to the story of a past funeral, where the woman, Gudrun, mourns her murdered husband Sigurd. The Killer can be found among the near relations of this family, spun into a web of intrigue and lust for gold and power. Gudrun, paralysed by grief and ready to die, cannot weep. A number of women, breaking through the earth like tree trunks and voicing their own destiny, tries in vain to help Gudrun. Only at the sight of the dead body lying there without a shroud, she reacts. The pianist listens and the fingers play and conjure up the plot. Strange chords and tones find their way expressing the inexpressible, while the rhythm excites and redeems. When Gudrun at last lets her tears run freely and faces the truth, a stream of accusations and curses pours out. Directing a work written for the concert hall and consequently primarily for the ear may seem disrespectful, but adding a visuel dimension to the songs in Gudrun’s Sorrow seems so natural. These texts invite to dramatisation and this is supported by Heise’s highly expressive music accentuating the story’s narrator. We have chosen to intensify the drama by confronting Heise’s romantic tones with new music composed by Markus Fagerudd. The women’s eternal stories of grief, betrayal and revenge is ’pulled forward to the present’ so to speak in this meeting with the expressionist and contrasting piano music. By removing the focus from the aesthetical artsong to a dramatized version of the work, we hope these forgotten songs will be given a new life. Gudrun’s Sorrow is one of the most important collections of Heise’s songs from his later years. The texts are drawn from the Icelandic Sagas of The Elder Edda translated by H. G. Møller. The six songs were composed and published in 1871. The plot revolves around the central female character, Gudrun, whose husband has been murdered by her brother, and the affinity with stories from the Old Testament and the Greek Tragedies is evident. Gudrun’s Sorrow was composed at a time when Heise was trying to get more dramatic expression into his music and the songs bear the stamp of the great dramatic contrasts which are also underlined by the text. Furthermore fragments of thematic themes are used almost as leitmotifs, also pointing to the composer’s desire to underline the drama. Darkness and a foreboding tone dominates and just one out of six songs end in major (Thus spoke Gullrønd, Gjuke’s daughter). The Finnish composer Markus Fagerudd (born 1961) has written quite a lot of instrumental and vocal music and between 1981-98 he created theatre music for KOM-Theatre, Helsinki, City Theatre and Finnish National Theatre as well as music for film and television. The sequence of the five movements is the pianist’s own choice, thereby underlining the musician’s creative influence on the work. Many thanks to Skuespillerforbundet and Den Ingwerske Fond.